Nihonium, Flerovium and Oganesson need spelling corrections :). Also, can I download a PDF of this anywhere? Thanks for spotting the typos Neil, corrected now. And I’ve added a link to a pdf version below the image. No problem! Thanks for the PDF version, I’m looking forward to displaying this at the school where I work. I’ve also spotted one other spelling correction – Darmstadtium. Sorry to be a pain! Sorted, I hope its fit for your school’s wall now, but do tell me if you spot any other typos. Have just spotted Caesium – although Cesium is acceptable (if using American spelling). Probably more me being picky, but I think Caesium is the official IUPAC spelling :). Wow! 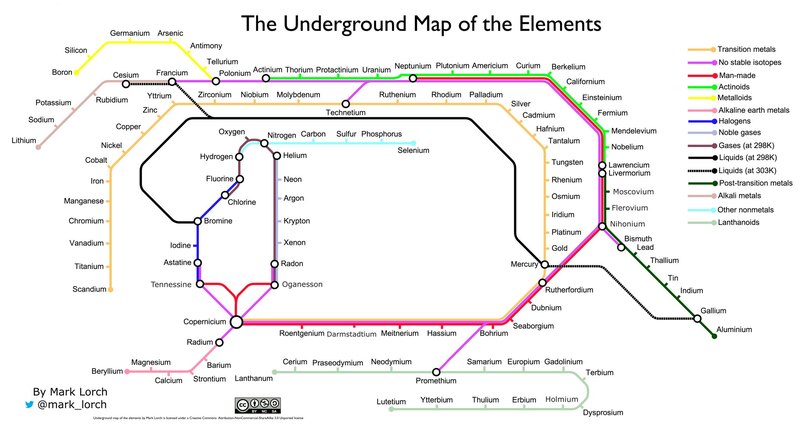 Representing the elements as an underground map is a great idea. Resplendent indeed!